I recently wrote a post about working towards our dreams. I really believe doing so goes hand-in-hand with what all of us are hoping to achieve in life-- happiness. Isn't happiness what we humans are always clamoring for? The most content people I know seem to be those who are working to make something happen for themselves (certainly not the ones complaining that they didn't, or can't, do this or that). I think it is also important to note that working on our dreams and ambitions doesn't just happen. As I've mentioned before in reference to motherhood, nothing awesome is easy. It usually isn't easy to go after something you want. Whether we choose to acknowledge it or not, we all have challenges and setbacks, though certainly some circumstances are harder than others. I try to remember that everyone's lives are more complicated than they appear. In a spirit of encouragement that you can do it too, I am sharing parts of my life that I have sacrificed in order to work on two of my current [outside-of-motherhood] pursuits: writing and horseback riding. 1. Social life. I lean introverted, so not filling my social calendar to the brim isn't my biggest sacrifice, but still... Mothers with young children have so little free time that we have to make smart choices about how we spend it. I could join a book club or a yoga class; I could meet up with friends for coffee or dinner on a Tuesday night. Those are great choices, but 90% of the time, I use my precious free time to work on my writing career, go to my weekly horseback riding lesson, or volunteer at a therapeutic riding center (I just started!). I actively prioritize my life around my main goals. 2. Risking Rejection. If you have been reading my work for a while, you know I fully admit to that not-so-spectacular trait of wanting everyone to like me. Getting rejected as a writer is hard. I risk receiving a punch in the gut every single time I submit something to be published. The rejection hurts every time no matter how many publications I have under my belt. 3. Looking Foolish. I knew I could look like a flaky "bored housewife" getting on a horse again in my 30's. At my worst, I pictured the trainers laughing at my 30-something self. Again, I had to put that insecurity aside to take the plunge back into riding as an adult. Risking looking foolish trumped the regret I pictured feeling years down the line if I didn't pursue it. 4. Evening downtime. Does the best part of your day ever come after you get the kids in bed? For those of us who care for the needs of our little ones day after day, there is nothing like alone time at the end of the day. However, similar to #1, if I am going to get some work in every day, after the kids go to bed is a time for me to do so, even if I'm feeling lazy or tired or my house is a mess and I should clean it (I have the messiest house of all my friends). Disclaimer: I love spending time with my husband, and fortunately, like most men, he is perfectly happy to sit in companionable silence, perhaps with the Big Bang Theory on, while we sip on beer and type away on our laptops. 5. Financial choices. Most dreams require funds. Writing, fortunately, is basically free for me. Once I have a good laptop and an internet connection, I can write. From a broader perspective, however, we are a one-income household. While it is a "luxury" for me to be able to type away if my daughter is napping and my son is at preschool, one income also leaves us with fewer choices on how to spend our money. So, have I given up a full-time career to stay home? Yes. But I use what little time I have left (see 1 and 4) to work quickly and efficiently on what I love (without a guaranteed lunch break). Horseback riding isn't the cheapest hobby, but I don't belong to a gym. I don't go to Yoga or any other fitness classes. We don't have a housekeeper. Again, so much of it is about choices. We save money for the things we want to commit to. Bottom Line: We have made choices that work for our goals, and you can too. There are no magic shortcuts. Sure, there are some lucky breaks, but the familiar catchphrases featured on any generic inspiration poster ring true to me when talking about goals and dreams-- they take dedication, courage, work, and time. 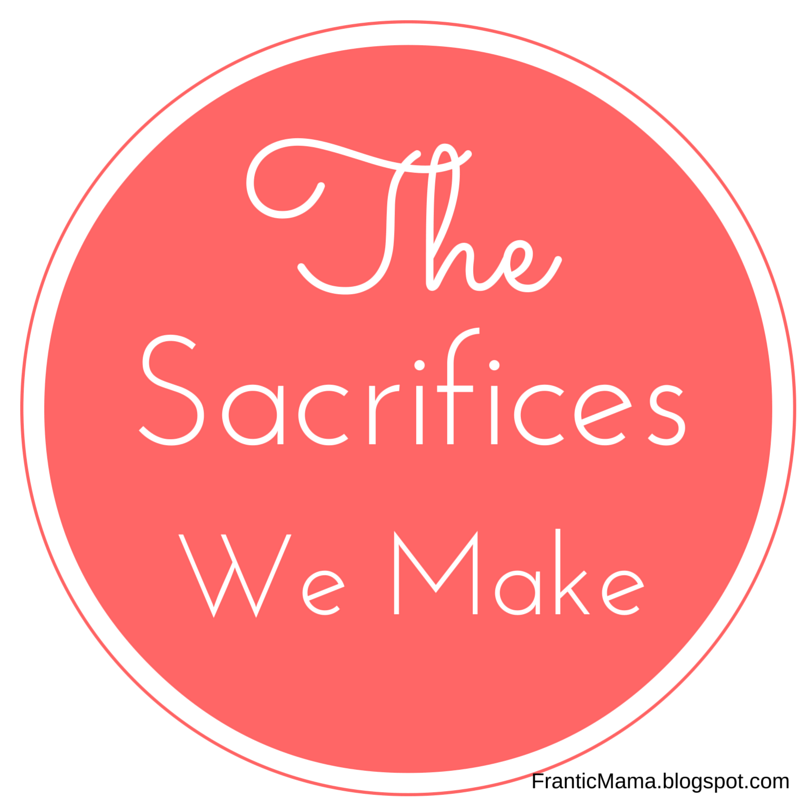 What sacrifices have you made to pursue your ambitions outside of motherhood? P.S. Are you a writer? How do you make time to write? Feel free to write a post about the sacrifices you have made to write, and Comment on this post with your website to share it with my readers and me. We can make it into a link-up of sorts! Oh Julia, I love this post. It is so, so important to talk about what we're NOT doing. I run into an interesting conundrum with folks... they tend to think that I "do it all" and am accomplishing everything all the time. And really, I'm not. I'm like a duck - floating on top and paddling madly underneath. I definitely let things go in order to follow my dreams. No one has time to do it all... and I think that misconception has gotten wrapped into the mythos of the "power mom." Such good points, Dakota. I don't think there is such a thing as a "supermom," and really, I think the idea that becoming a power mom/supermom is an achievable goal does a disservice to us. When I feel myself trying to do everything perfectly (and my perfectionist nature clicks in), I wear down fast and it strips me of the little joys in life. Let us know if you write about what you have let go in order to pursue your artistic endeavors! I love visiting your site. You make me feel less alone in my insecurities of being liked, being rejected in my writing and I love my alone time at night. I think last night I only got a few hours sleep cause I over indulged in my alone time. :-) The last week my little man hasn't wanted to settle at night. I thought I would go crazy without my down time to regroup my brain and prepare it for another day. I'd love to hear more about your therapeutic riding center. Sounds really interesting. I used to volunteer at riding for the disabled and it was very rewarding others. I am becoming better at rejection. At first I'd have a cry but now I am trying ever so hard to learn from it and spur me on to learning more and improving my writing. I write late at night usually. I keep telling myself writing every day will help me improve and grow. I now miss it if I miss a night writing in my journal. Paper and pen of course. lol I really enjoyed reading your post as always. Thank you so much for your kind words, Becky. It sounds like we have a scary amount of things in common :). Dakota (see above) and I have joked that we were separated at birth-- maybe we were triplets :). Anyway, yes, I pretty much go crazy without ample alone time. Preschool spring breaks and sick children always bring me close to the brink because of the constant mommy time they need. The therapeutic riding center is for children and adults with disabilities. I just started helping out there, and love it. I used to teach kids with disabilities, and I have always loved horses, so it is a really nice fit for me one evening a week. Do they still have centers like that near you? How crazy that we both have done it before! Have you thought about trying it with your daughter? Well, I'm off to make a cup of tea for an extra boost of caffeine!